I build a giant version of the Delptronics LDB-1 "Little Drummer Boy" analog drum machine kit. It is pictured below next to the standard kit to show the scale. The actual assembly was not difficult. Of course, when I assembled the kit, I skipped all of the parts that would eventually be panel mounted. Instead of getting all new panel mount jacks, I could have positioned the PCB at the back edge of the enclosure and drilled holes for the board-mounted jacks to come through. However, lining up the holes is such a hassle that panel mount parts are just easier. Once the parts were soldered on the PCB, I soldered wires for all the jacks, buttons, LEDs, etc to the board, then to the panel mounted parts. 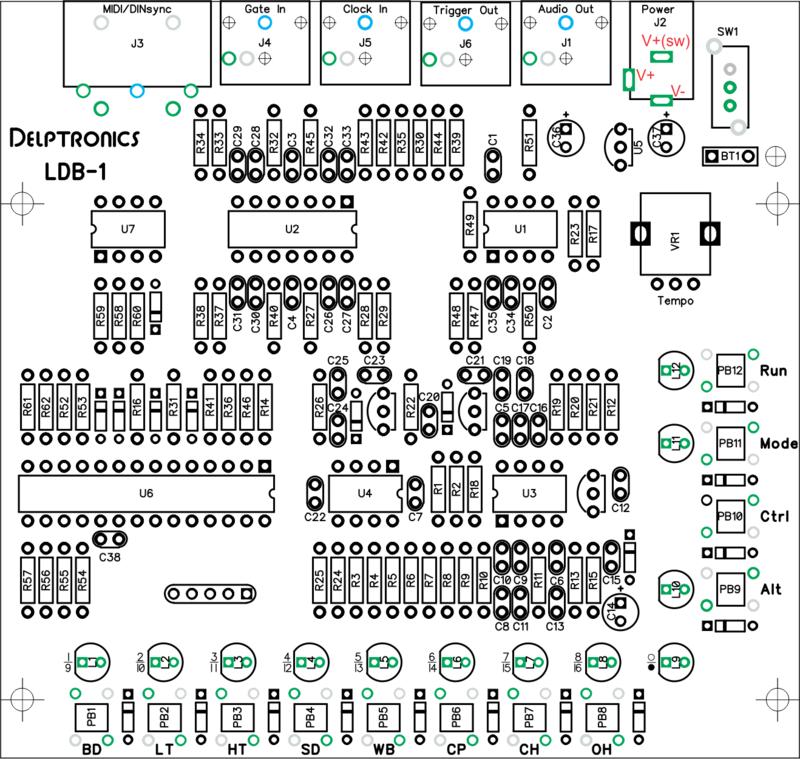 Here is a color-coded diagram of the LDB-1 PCB that will be very helpful if you want to build it with externally mounted parts. The pads that you need to connect to are green. Some pads are gray to indicate that there is no panel connection, just for extra clarity. I colored the ground pads blue so you know you can wire them together on the panel. Keep in mind that this is a bi-polar circuit, so the negative power connection is V-, not ground. All told, it was about $100 in extra parts, plus $140 for the kit, plus about eight hours of work. The result is well worth it. I now have the biggest Little Drummer Boy on the planet! Of course, being the inventor of the LDB-1, I had a head start, but I would love to see what other people do with the kit.